Sometimes our animal nature takes over and we disregard what’s good for us. This is TomCat. He wandered onto the property two summers ago looking somewhat worse for wear. I named him. He stayed. Indoors, TomCat tends to be a pushover. All the cats except his buddy, Slick, swat him away from the food and allow him the barest edge of a cushion or chair. Outdoors, we suspect he’s unwilling to let the lack of testicles dictate his social skills. On the way to the vet this weekend, Frank noted that we have spent more time in the ER of the local animal hospital with TomCat than we ever did at the Children’s Hospital. From the location around his neck of the large contusions, abscesses and all that goes with using one’s claws and not one’s words, it seems TomCat tangled with something rather fierce and with big teeth. The evidence points to a willing engagement or the bites would have been on his rear, explained the very chatty vet. Her verdict: house arrest for two or three days until the wounds stop oozing and he’s feeling less punk. He’s perfected his caterwauling skills for the two days he’s been incarcerated and no amount of logic is swaying him from his unshakable claim that he has been wrongly sentenced. Keeping him in, however, is more than just logic about healing. There is something large out there and because his buddy, Slick, hasn’t been home for three days, I’d prefer to worry only half as much. We often don’t know that a closed door is better for us than access to everything our nature desires. Even when we’ve been hurt and mangled, we cling to the idea that there is no connection between where we were and what happened. A closed door challenges our beliefs that we are entitled to everything on the other side of it. It also triggers our fears that we will miss out, not have, be deprived of what is rightfully ours. Old habits die hard, I suppose. 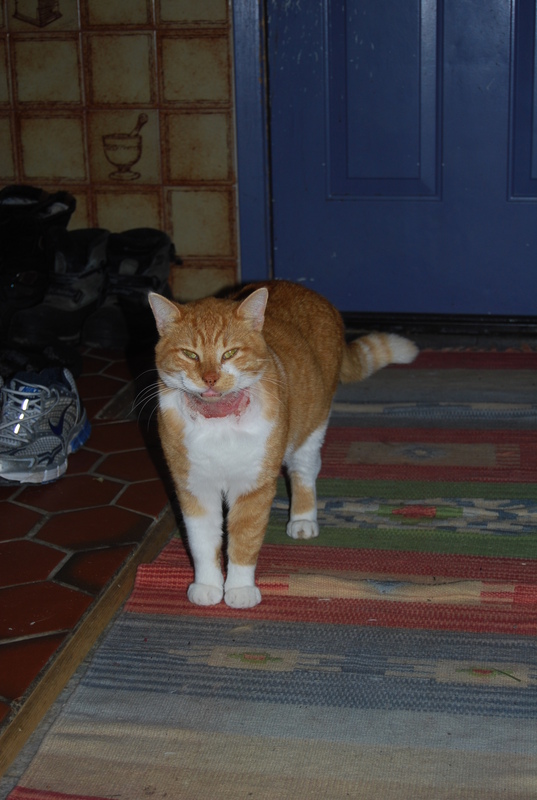 On other occasions, TomCat howled and the door opened. Having been there in various forms, I understand completely. Been there, invested in the relationship, climbed the ladder. Sat in front of that closed door. Sometimes for years. Sometimes even waiting for a window to open when that door closed. It didn’t occur to me until recently that the closed door is practice. It brings me face-to-face with my greed, my sense of entitlement, my assumptions that wanting is all that is required for having. Consider the generosity of a closed door. It gives the space to heal, to come into one’s own. And given I’m not big on leaping out of windows as an alternative to closed doors, it is also a chance to explore what is already here. I’m beginning to think it’s time to find a quiet place to curl up and live life as it is. This entry was posted in 108 thoughts, reflections and tagged gardens, greed. Bookmark the permalink. In my experience, going on retreat closes the door more tightly than anything else. It doesn’t feel generous or healing, of course, but perhaps that says more about the reliability of feelings than it does about the retreat. I hope TomCat heals quickly and soon returns to his daily life. Cats just want to do their cat job – and nothing more (or less). 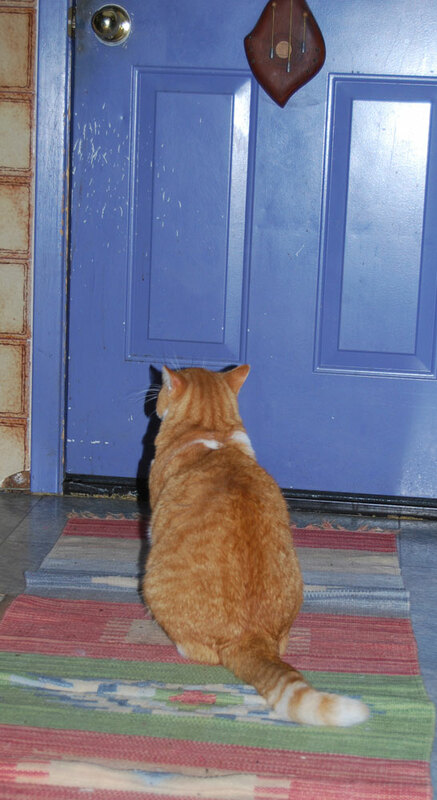 Every time TomCat went to the door, it reminded me of sesshin! Of course, your post about your every patient cat was quite the harbinger of what we do to our pets hoping to make ourselves happy. Just on a practical note. We used to have a cat who liked to fight but wasn’t particularly skilled at it (or perhaps we didn’t see the other guy?) but he was constantly sporting puncture wounds. A vet told us about ledum (a homeopathic remedy) and it worked like a charm. It does sound (and look) like Tom’s wounds this time are larger than a puncture wound but perhaps it would aid in the healing this time or for future encounters. Hoping for the safe homecoming of Slick. “The closed door is practice.” Yes, I *feel* this too – curling up and letting life be as it is – surrendering. Many closed doors these days, which is why the “window sitting” gives me the opportunity to attend deeply to all things internal… Like a hibernating time. Lately I feel like TomCat on the book shelf – finding safe refuge. Thanks for the advice, ZDS! I’ll check that out. Christine, as I read your comment, it occurred to me that your window practice is a wiser aspect of the “closed door-opened window” saying. Thanks for introducing us to it! 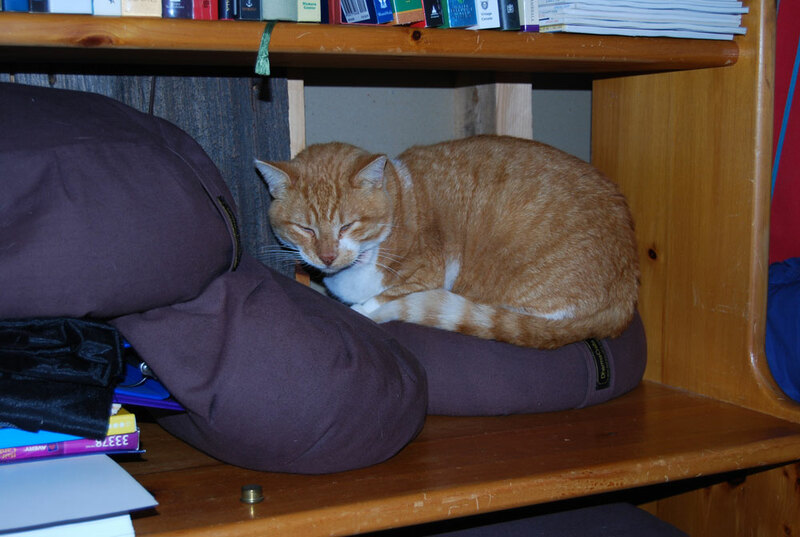 And, for the record, TomCat on the meditation cushions is the pinnacle of being spolied aroud here! I fear the worst about Slick. He’s never one to miss dinner at home or to stay out in the rain. And it’s pouring buckets now. When I was a kid, I thought my parents verged on the edge of cruel in the things they wouldn’t let me do, but I never imagined I’d be grateful. Who would have guessed that they really did know what was best for me! Sorry to hear about Slick and Tomcat. If you live outside an urban area, you might want to tell Fish and Wildlife about what happened. It might have been a coyote or bobcat, but cougars are also notorious for causing pets to disappear. All of these tend to be a real danger to anything smaller than themselves, ie children. Thank you, Sunim. We are out in the rural wild. Moose, deer, coyotes, and fishers. Apparently a fisher bite is very damaging so given the kind of wound, TC wouldn’t have survived if it had been a fisher. More likely a coyote, local dog (though they’re all quite cat friendly for farm dogs), or one of the feral cats. Frank swears he saw a bobcat but I doubt it. I’ve been thinking about spiritual closed doors. Have to work with that one!